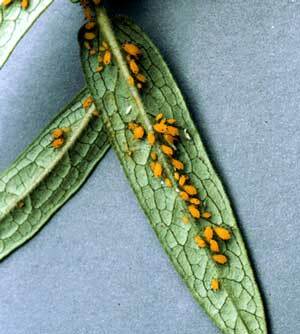 Aphids are among the most common pest insects inside on houseplants and outside on almost any plant growing in the normal home landscape. If your yard has good diversity of plants, you feed songbirds, and you don't use any broad spectrum insecticides the following beneficial insects and songbirds love to eat aphids and if in sufficient numbers will keep aphids under control. Beneficial insect predators loving aphids- Assassin Bugs, Bigeyed Bugs, Damsel Flies, Ground or Tiger Beetles, Hover Flies, Ladybugs, Lacewings, Rove Beetles, Soldier Beetles, and Spiders, just to name a few. Songbird predators devouring aphids - Catbirds, Chickadees, Finches, Mockingbirds, Nuthatches, Woodpeckers. If you don't have this army of predators on your property, the rest of this file will help you deal with your aphid problem.